Most people do not think about socializing cats or kittens. The whole behavior thinking process of a cat is different from a dog since they are mostly solitary. As household pets living with a family and exposed to all kinds of situations it is beneficial to give your cat the best and most interesting life you can. It will help if you expose your cat to many different things. Instead of socializing, you could call the work you do with a cat “desensitization.” This means they are calm or cooperative in many new or different situations. As a cat parent you are probably saying it can’t be done. Yes cat training is possible and can start at a young age. In fact, most people have never bothered to work with their cats and believe all the old myths floating around about our finicky feline friends. 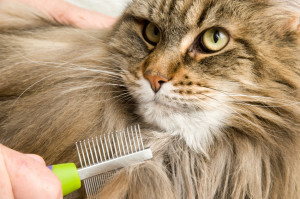 Some of the things to think about doing with your cat are: Traveling, teaching them to allow you to restrain them, brush them, check their eyes, ears, paws and teaching them what proper scratch items are! They can benefit by traveling around with you on errands, spending playtime on a leash in new areas, and being exposed to new people and animals in controlled environments. All this work will pay off as the kitten grows into a cat. 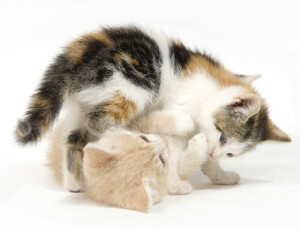 The more you involve your kitten in activities and interactions with others, the calmer they will be. The benefit is that they will be more likely to respond without fear or defensiveness as they grow older. Your Veterinarian and the Groomer will love you for it! Teaching your kitten right from wrong at an early age will prevent them from challenging you as they get older too. They will not necessarily like what it is you want them to do but they will more likely to cooperate if you have worked with them early in life. Working with your cat should be done in short calm sessions. Brushing them is a good place to start with since it is so pleasurable. Next you can examine the ears by rubbing them. 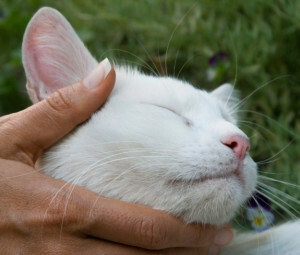 As you rub you can look in their ears, and touch different parts of the ear with your finger. This is great if you have to clean ears or medicate the cat later in life. GO SLOW! The biggest problem most people have is moving too fast with this type of work. You can also help develop your cat’s intelligence by exposing them to lots of new things. A different amount of toys that are changed or rotated are a necessity. The most favorite toys can be pretty simple. Paper bags, the rings off of milk bottles, rolled up foil and other household items make great play items on a budget. They always seem to be the favorites over anything else too! 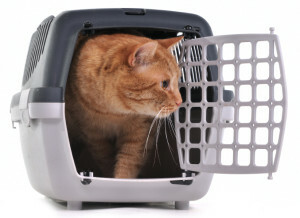 Teaching a cat to crate or enter a carrier is one of the more critical things to teach. Placing bedding in it or traveling with the cat in the carrier will get yourfeline comfortable with it. This is critical should the need for disaster evacuation, temporary housing during travel, and restraint be necessary. Many people have lost their cats because they were moving and did not think about securely putting their cat into a carrier or separate room for their safety. These suggestions and ideas will help show you what to do with your cat to make them happier, healthier, more secure and perhaps a bit more cooperative despite their independent nature.